Provide an overview of the amendments proposed by the NSW Government to introduce state-wide planning rules in relation to short term rental accommodation (STRA) and enable Council to make a submission on the proposals. The proposed planning changes are part of a recently announced NSW Government framework for STRA in NSW that also includes a mandatory ‘code of conduct’ and changes to strata legislation. That Council make a submission on the proposed NSW Planning Framework for Short Term Rental Accommodation based on the contents of this report. 1. Adopt the recommendation to make a submission based on the contents of this report. Implications: This is the preferred option, as it will enable Council to provide a submission on by the agreed deadline. 2. Adopt an alternative recommendation to amend or add comments to the proposed submission points. Implications: Clarity will need to be provided on and additional or amended comments. 3. Do not make a submission. Implications: This is not preferred as it will be a missed opportunity to provide feedback on the proposed reforms. Holiday homes have been an important feature of the Shoalhaven for a considerable period and Council clarified their legal status through an LEP amendment that was gazetted in 2006 – the short-term rental of a residential dwelling does not require development consent. This provision was essentially retained in an amended fashion in the new LEP 2014. Council made a submission to the Options Paper and commented on the options. The submission noted in conclusion that: Given the significance of STHL to tourism in Shoalhaven, Council has had an ongoing and active involvement in this issue and still supports our current approach or one that is similar (essentially “light-touch”) where the vast majority do not need consent or approval, but problematic ones can be regulated. Following consideration of a Councillor Notice of Motion, Council resolved on 27th February 2018 that the matter relating to Short Term - Holiday Letting - Development of a Contract be referred to a Councillor Briefing to allow the Tourism Manager and the Shoalhaven Tourism Advisory Group (STAG) to comment on what actions Council is undertaking and the current situation. The requested briefing was held off until the outcome of the NSW Government’s review was known. Council staff briefed Councillors on this matter on 27th July 2018. The proposed planning reforms in this regard that are currently out for comment were considered by the STAG at their October 2018 meeting. Their resolved position is detailed later in the report. · New independent dispute resolution process to resolve complaints, with NSW Fair Trading having powers to regulate online platforms and letting agents. The overall intended framework will be implemented through amendments to planning instruments, Strata Legislation and Fair-Trading Legislation. The Fair Trading Amendment (Short Term Rental Accommodation) Bill 2018, that deals with the legislative framework for the first set of reforms detailed above passed the NSW Parliament on 14th August 2018. It is understood that an Advisory group (that includes industry, Local Government and other representatives) is now assisting the Government (NSW Fair Trading) with the development of the proposed Code of Conduct, however its status and likely release for comment is unknown. On the 5th October 2018, the NSW Department of Planning & Environment (DP&E) released more detail regarding the proposed planning framework for ‘short term rental accommodation’ (STRA). Note: no longer referred to as STHL. Feedback is sought on the proposed framework and submissions can be made until 16 November 2018. Council has been granted an extension to comment until the end of November 2018. It is noted from the material that the proposed reforms are expected to start during 2019 and that other elements of the Government framework are being progressed separately including Fair Trading Legislation, STRA in strata settings and the proposed Code of Conduct. All that is it out for comment at present is the proposed planning framework that is part of the overall reforms. The commercial use of an existing dwelling, either wholly or partially, for the purposes of short term accommodation, but does not include tourist accommodation. · The dwelling has consent or existing use rights. It is also suggested that STRA will also be permissible in ‘secondary dwellings’. Some forms of residential accommodation will also be excluded (boarding houses, seniors housing, group home and affordable rental housing) to ensure they continue to be available for their intended purpose. · Provisions and development standards so that STRA is permitted as exempt or complying development. · Minimum fire safety and evacuation requirements for individual STRA premises. It is suggested that the proposed exempt and complying development approval pathways are based on different levels of risk associated with whether the host is present, bushfire prone land status and days of operation in a calendar year. The pathways recognise that in certain circumstances STRA has minimal impact and as a result a lower level of regulation is appropriate. In complying development circumstances, a Complying Development Certificate (CDC) will need to be obtained by the landowner. Under the proposals this will require specific bushfire prone area issues to be addressed. Regional Councils and number of days – under the proposals STRA will generally be permitted outside Sydney for 365 days a year. However, Councils in regional NSW will have the option of reducing the number of days from 365 when the host is not present to no lower than 180 days based on local needs. · Current use (dwelling) must be lawful, permissible under a planning instrument and in a building approved for residential accommodation. · The building must comply at all times with all relevant planning, building, strata, fire safety and health regulations. · No alterations/additions permitted to building unless otherwise exempt. Other than identified safety standards the STRA activity does not authorise any building work – these need to follow existing approval pathways. · Must be consistent with existing conditions of the most recent development consent applying to the building. · Comply with relevant strata scheme requirements. · Dwelling must comply with proposed safety standards (see below). · Land must be certified as being no more than Bushfire Attack Level (BAL) 29 risk rating. · If the property exceeds BAL29 bushfire risk, then it is proposed that a development application will be required. It is also proposed that dwellings will not be able to be let for STRA to unrelated parties at any one time. ‘Related parties’ include families, friends and/or colleagues. Noise/amenity impacts – no changes are proposed to the powers that are currently available under existing legislation. Additional policy elements – it is suggested in the EIE that all elements of the Government policy in this regard will work together to enable STRA, while managing potential impacts. Mandatory Code of Conduct – will be developed in consultation with stakeholders. Will include complaints resolution. Fair-Trading NSW will have oversight of the Code and enforcement powers. Strata Setting – Relevant legislation will be amended to allow owners corporations (75% majority) to make a by-law that prohibits STRA where a lot is not a principal place of residence. Transitional arrangements - The proposed new state-wide planning framework will automatically apply to all Councils in NSW. DP&E will work with those Councils whose LEP’s have existing provisions on transitional arrangements (Note: this includes Shoalhaven). It is specifically noted in the exhibited material that feedback is welcomed, but that the state-wide permissibility of STRA and the number of days it can occur have been endorsed by the Government. Holiday homes or the short-term rentals have been a feature of tourism in the Shoalhaven for a long time. They play an important role in the tourism economy of the City, with approximately 60% of domestic overnight visitors to the City staying in what could be termed short term rentals (Tourism Research Australia 2017). As a result, Council has continued to take an active role in research, advocacy and regulatory changes related to this form of accommodation. The state-wide clarification that the proposed reforms bring is generally welcomed. Council has continued to favour a ‘light touch’ approach in this regard, provided the problematic premises can be regulated or controlled when required. It is important to ensure that the proposed reforms assist in this regard and can be adjusted in the future if needed to ensure they are workable and do enable problematic premises to be managed. Further clarification is needed on how the overall package of reforms fits together and will be implemented/managed moving forward. For example, it is difficult to fully comment on the planning package without knowing what the proposed Code of Conduct contains and how it will be implemented/enforced. The EIE advises that all elements of overall policy will work together, however other advice indicates that components are being developed concurrently, but as separate matters. For example, the Code of Conduct and the planning instruments. It is imperative that all parts of the package are complimentary and support the overall intended framework. It is difficult to know whether this will be the case without seeing all the components together. Further clarity is needed on how the planning components interact with the Code of Conduct and its associated aspects. It is noted in the EIE that proposed Code will be “co-regulatory” – what does this mean? It has been suggested that a body will be set up to administer the Code of Conduct and it is not the Government’s intention to have an enforcement role. Greater clarity is needed on who or what this new body is. It is likely to logically sit under or with NSW Fair Trading, but the actual role and functions that it will perform has not been made clear yet. It is still highly likely that the community will expect Council to assist with or become involved if they have an issue with a holiday home in a local street, particularly if the new oversight body is not readily accessible. Council is likely to still become involved in noise complaints and the like under relevant existing legislation and it is noted in the EIE that “the Department of Planning and Environment will provide information to Councils, industry and the local community on the application of these powers”. This clarity would be welcomed, and it is also important to understand how any amenity complaints under existing legislation will play a role in the new framework – for example will a valid complaint under existing noise legislation be one of the proposed two strikes or not? The issue of compliance with the proposed planning rules requires more clarity, for example how will compliance be undertaken for the proposed safety measures where the use is exempt? Clarity on how the proposed reform package interacts with existing legislation and associated compliance, such as the Protection of the Environment Operations (POEO) Act, will also be essential for Councils and others moving forward regarding noise impacts, on site sewerage management, swimming pools (Public Health Act) etc. One specific aspect that Council needs to comment on is the number of days that STRA can occur in Shoalhaven when a host is not present. Regional Councils can rely on the maximum 365-day number or set the number of days, if needed, between 180 and 365 to respond to local circumstances. There are also no criteria to consider, for consistency, should a Regional Council wish to set a specific number of days for its area in terms of ‘local need’. As such, there is a risk that if an arbitrary number is selected that it could impact on Shoalhaven’s broader tourism economy. It is noted that the current Shoalhaven LEP2014 provision related to short term rental accommodation provides for a maximum period of 45 consecutive days in any 12-month period, although this has not been monitored or rigidly enforced. There is also no detail in the planning package on how the number of days will be set, measured and by whom, should a number less than 365 be requested. Clarification should be provided in this regard. The EIE notes that Regional Councils that want to reduce the number of days are invited to submit an Expression of Interest within 8 weeks of the exhibition commencing. However, the EIE then goes on to note that if a Councils LEP does not amend the day threshold, the per annum state-wide policy will apply. This appears to indicate that Councils can potentially amend the number of days via their LEP, possibly later. This needs to be clarified by the Government, if it is the case it will provide the option to start with the state wide maximum, but possibly reduce the number of days later should issues emerge. In this regard it is noted that it is possible for Councils to amend a SEPP via their LEP if supported by the Department. Given the above, it is recommended that Council accept the general permissibility provided for Regional Councils under the reforms of 365 days per year. The EIE currently focusses on the permissibility of the ‘dwelling’ that is utilised for STRA. However, given that Shoalhaven clarified the legality of STRA back in 2006, the Government may also need to clarify whether any dwellings that can show they were used at that point on for STRA benefit from existing or continuing use rights, particularly in regard to the requirement for CDC or DA on Bushfire prone land. 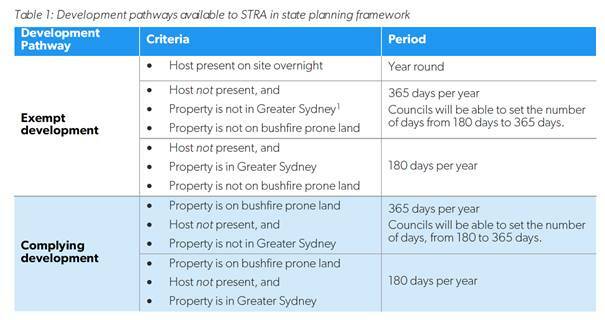 The implication of this is that even though the Government are trying to clarify the approval paths and requirements for STRA, they may not be as straight forward as presented in Shoalhaven given the current planning circumstances. If land is identified as bushfire prone, then the use needs to be considered as complying development. Given the extent of land within Shoalhaven mapped as bushfire prone it is likely that this will be a frequent future development pathway in our area given the number of existing dwellings that are in mapped areas. The EIE identifies that to utilise the complying development pathway, land needs to be ‘certified’ as being no more than Bushfire Attack Level (BAL) 29 risk rating. Whilst bushfire prone land maps are available and property owners will be able to identify whether their property is bushfire prone on not, the requirement as presented around BAL 29 will require properties to be individually assessed. The process in this regard should be clarified but is likely to impose an additional cost on affected owners as they will need to engage someone to assess the BAL of their property if it is bushfire prone. Also, Section 4.14 of the EP&A Act states that a certificate is from a person who is recognised by the NSW RFS as being a qualified consultant in bushfire risk. If it is intended that these persons will be required to certify the risk rating of the land, then this needs to be very clear in the legislation. The EIE is silent on external bushfire impacts, for example, if the property itself is not bushfire prone, but the only access to/from it is and is impacted in a fire event? There do not seem to be any additional provisions for complying development other than the BAL 29 requirement, for example the need for a bushfire procedure or similar for guests who may be unfamiliar with the area to know what to do in the event of a fire – emergency radio frequency, evacuation routes, what to do if evacuation is not possible and the like. The EIE documents focus on two likely development pathways – exempt development or complying development. The EIE also suggests a third pathway - development application (DA) for dwellings that sit on land that is identified as exceeding BAL 29. More clarity is needed regarding this pathway and specifically what the required DA needs to be prepared or assessed against? The Shoalhaven DCP 2014 currently contains a Chapter related to ‘Short Term Rental Accommodation’ the status of this will require clarification as the reforms are implemented. For example, does it need to remain in its current form or be amended for those instances where a DA will be required? Where the approval pathway is differentiated by “when a host is or is not present on the site overnight” this will need to be clear in the legislation in terms of what this means and how it will be measured. The addition of a consistent definition for STRA is generally welcomed, however the form of the proposed definition may cause some confusion when most people will simply see the practice as a form of tourist and visitor accommodation. The current definition may benefit from additional wording or an ‘advisory note’ to clarify what constitutes ‘tourist and visitor accommodation’ as defined in the Standard LEP Instrument. The EIE suggests that ‘secondary dwellings’ will also be able to be used for STRA. This could potentially create a range of issues and may not be desirable or manageable in all circumstances. For example, where the existing dwelling is let to one party and the secondary dwelling is let to another party – see the following comments re ‘unrelated parties’. The EIE notes that it is proposed that dwellings will not be able to be let for STRA to unrelated parties at one time. It goes on to indicate that “related parties” would include families, partners, friends and/or work colleagues. The intent of this suggested provision is acknowledged in that it is focussed on not allowing a dwelling to be let at any one time to different people/parties, i.e. non-related. However, it requires greater clarity in the final legislation to ensure that it is clear and can be enforced if needed. Further advice is required on how this will be implemented as it may sit better in the intended Code of Conduct and related mechanisms. This is another example of why or how the overall reform package needs to work together. Given that Shoalhaven already has planning provisions that deal with STRA we will be one of the areas affected by the transitional arrangements. The EIE notes that DP&E will work with Councils to amend their LEP’s to be consistent with the state-wide framework, including appropriate transitional periods. This is essential to ensure that it occurs in a consistent and timely manner. Further ongoing advice will be sought from DP&E in this regard. Additionally, the future role of Council’s existing related DCP Chapter will need to be clarified. As noted above it may need to be related in a modified fashion to assist in those circumstances where a development application is required. Table 2 Proposed Safety Requirements in the EIE uses the word “should” in the requirement that “entry doors should be openable from inside the dwelling without a key. If this is a mandatory requirement it should be changed to “shall” or “must”. At present, only the Fair-Trading Amendment (Short Term Rental Accommodation) Bill 2018 has been finalised and the proposed planning framework released for comment. It is thus difficult to holistically comment on the proposed reforms at present. There are a range of uncertainties surrounding how the two legislative components relate to each other that will hopefully become clearer as more information is released and Councils continue to be involved in the process. At this point it is recommended that Council make a submission on proposed planning framework for STRA based on the content of this report and receive subsequent report on the further detail as it is released. Councils existing LEP and DCP contain provisions related to STRA. It is likely that the LEP will be directly amended via the Standard LEP Instrument changes when they occur. As noted earlier in the report, the future of the DCP Chapter related to STRA needs to be clarified.